It’s been a while since I’ve heard anything new from Jeff Greinke, probably my own fault since he has close to 20 releases to his credit now and I’ve heard less than half that number – mostly his early works from the 80s and 90s. Those classic early works were like lush ambient sound-paintings built mostly on dense multi-layered synth textures, creating moody slow-moving worlds of dramatic intensity. 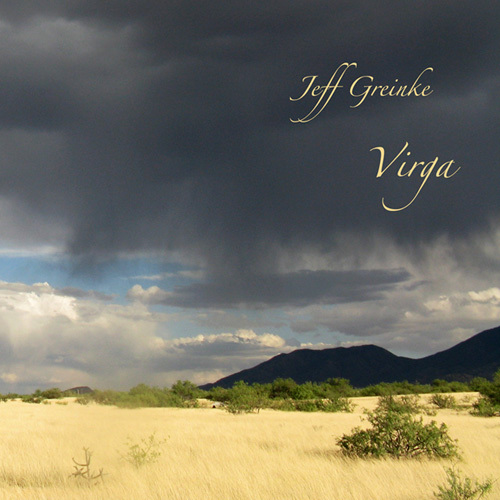 To its credit, Greinke still utilizes much of that bold visionary cinematic feel to create the twelve pieces on Virga, although many new elements have been added to Greinke’s music, giving it a more overtly melodic articulation that intertwines with the atmospheric textures. Piano is one of those elements, offering a basis for well defined melodies that drift freely amid lush textural soundwalls, along with guest cello and trumpet that give many of the cuts a distinctly chamber feel. “Virga” is defined as wisps of precipitation falling from a cloud but evaporating before reaching the ground; anyone who has approached an incoming storm has probably seen this phenomenon first hand, and indeed this is a strong visual corollary to some of the more dreamy atmospheric works at hand, many bearing a somber or dark undercurrent that evolves slowly. This is a distinctive and engaging release that won’t put the listener to sleep.